Cancun, Mexico is one of those destinations that has so much to offer, with a host of things to do. The Jolly Roger pirate ship show in Cancun is just one of the many activities and tours you can choose from. The Jolly Roger pirate ship show takes place on a replica of the Santa Maria galleon on which Christopher Columbus sailed when he went to the Americas in the sixteenth century. Built around a safe steel frame with all the modern safety features and a motor, the Jolly Roger imitates the Santa Maria in style, sailing Cancun’s shores each night of the week. 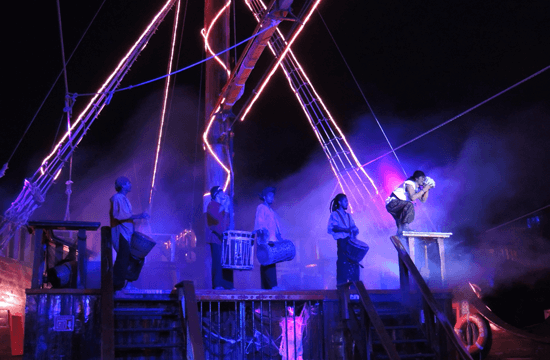 Joining the crew of the Jolly Roger pirate ship show is like a lesson in history and an encounter with the past. Cancun things to do don’t get much better than a pirate cruise and you can book tickets online or at one of the many booths throughout Cancun. Most reputable hotels and resorts will also sell tickets for the pirate ship show. When you reserve your place on the Jolly Roger pirate ship show, you must also decide on your meal. There is a selection of options as well as vegetarian and children’s meals. The pirate ship show sets sail from Playa Linda Pier which is next to Cancun’s theater in the Hotel Zone. All taxis will know where to take you. There is also some parking if you have rented a car. Once you arrive to the pier, the show will seem to already have begun with pirates taking your tickets and escorting you to the waiting area. There is no escaping the charm of the pirates. The pirate ship show lasts nearly 4 hours from the time you arrive to the port till the time you leave. You will enjoy a full night’s entertainment, as much as you can drink and a meal all included in the price of your ticket. The pirate entertainment is bilingual and family oriented. There is a part in the show where more adult humor is evident and at this point, kids are invited to take part in a treasure hunt. All in all, the Jolly Roger pirate show is great family fun. For more things to do in Cancun. Check out the article on the top activities in Cancun.